Delta Dentures | Delton Denture Clinic, Ltd.
Chris Kozakiewicz has fabricated dentures, partial dentures and dentures over implants in Delta in Surrey, British Columbia, and the surrounding areas for over 18 years. Since welcoming a second denturist, Kaja Donauer, into our practice in 2011, Chris has been able to focus more closely on dentures over implants. At Delton Denture Clinic, we aim to create a welcoming and warm environment for all of our patients. As denturists in Delta, we fabricate our dentures on the premises in our onsite, modern and fully equipped laboratory facility. This allows us to control fully the entire denture fabricating process. We take pride in the work we do with local oral surgeons and dentists in the area. Whether your dentures are in need of repairs or you would like to be fitted for a new set, or are interested in All-on-4 dental implant therapy, give us a call and we will be happy to schedule you for a free, no commitment consultation. With our onsite lab, the denture creation process is streamlined and efficient, making for a seamless and quicker experience for you. We are committed to fulfilling our duty to our patients through providing excellence in clinical care and customer service. We achieve this standard of practice through the continuous efforts of our dedicated and competent staff. At Delton Denture Clinic, we provide a caring atmosphere and quality care to all of our patients. A smile is the first thing people notice; we help create the new you. As a new patient of our denture clinic in Delta, we welcome you into our caring and personalized environment. Our front desk staff will greet you and ask you to fill out some minor paperwork while we gather information. We understand that some of the concepts may be a bit confusing so we offer ample education and reading materials so that you can make an informed decision about your denture treatment plan. 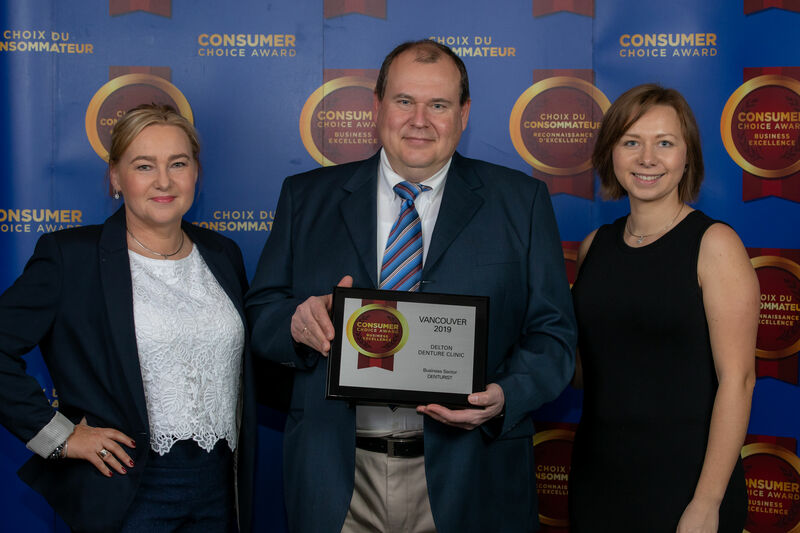 We are so proud to have won the Consumer Choice Award again! Thank You to all of our dear patients for voting for us! Whether your dentures are in need of repairs or you would like to be fitted for a new set, give us a call and we will be happy to schedule you for a free, no commitment consultation. We are committed to fulfilling our duty to our patients through providing excellence in clinical care and customer service. We achieve this standard of practice through the continuous efforts of our dedicated and competent staff. At Delton Denture Clinic, we provide a caring atmosphere and quality care to all of our patients. A smile is the first thing people notice, we help create the new you. We genuinely hope this site is helpful to you in learning more about our practice, procedures and treatments, prosthesis types and more. Delta, BC denturist, Surrey, Chris Kozakiewicz is a professional denturist dedicated to excellence in prosthodontics from providing dentures over implants to full and partial dentures.